It is a great delight to join you for breakfast. I much value this kind of opportunity to exchange ideas, and share observations, about the advance of China-UK business links. · Our two-way trade has crossed the 80-billion-dollar threshold. · Our mutual investment topped 20 billion dollars in the past three years. That was more than the total in the past three decades. · And our financial cooperation has made enormous progress - London is on course to become a major global centre of off-shore RMB business. It is always tempting to look back and talk about achievements! · Let us not rest on our success. · Let us look with fresh minds about how much more we can do. · Let us with renewed vigour seize the greater opportunities before us. So, going forward, how should we take in the current situation and the overall picture? What are the favourable conditions and opportunities? I believe there are three things we can do. Recently some western pundits have been predicting a so-called "China's economic meltdown". These predictions simply do not hold water! · Despite the impact of peripheral factors that has put downward pressure on China's economy the annual growth rate has stayed at 7%. · That means an annual net increase of 800 billion US dollars. · To put that in context - this is roughly the size of the total GDP of Turkey in 2014. It is larger than the GDP of another G20 country, the Netherlands. On top of the steady growth, China is accelerating the pace of economic structural upgrading. The focus of this effort is to encourage grass-root start-ups and innovation. The goal is to give the economy new vim and vigour by making innovation a new driver of the economy. The Chinese economy is showing great resilience and fulfilling untapped potential. That trend is very clear for any observer who analyses China with an open mind and fair judgment. That means that China in the coming ten to twenty years will maintain steady and moderate growth. Turning to the second action I propose. This is to catch the fast train of China's opening up. · The pattern of massive import and export trends will give way to high value-added trade that emphasizes quality and efficiency. · A series of external development strategies and measures are being rolled out that will create mutually beneficial cooperation between China and most countries of the world. These are also demonstrations of China's commitment to mutual benefit and win-win with the world. The UK was the first among major western countries to come to the decision and join the AIIB. This is certainly a show of strategic farsightedness on the part of the UK government. The UK Government lead should be viewed by British business as a call for action. It is now up to British companies to keep up with the government's pace and outperform. It is time to take an active part in the building of the "Belt and Road", to seize the opportunities and to shape a future of win-win cooperation. My third and final action point has a focus on China-UK relations. All of us must work together to help build a strong China-UK relationship that always sets the tone for bilateral business cooperation. There are many success stories in China-UK business cooperation. The business community should of course take the credit. Yet one should not forget the big picture, namely, this 'golden time' of China-UK relations. It is based on the ever-stronger political mutual trust and the ever-closer high-level exchanges. · HRH The Duke of Cambridge paid his first visit to China. It was the most important royal visit to China in nearly 30 years, and it was very successful. · Prime Minister Cameron had a telephone conversation with Premier Li Keqiang shortly after his new cabinet was formed. The two leaders agreed to work together and take China-UK relations to a new level. · President Xi Jinping will pay a state visit to the UK later this year. This will be a new milestone in China-UK relationship. I hope that British business leaders will not only make best use of this 'golden time' but also work to consolidate and extend the 'period of strategic opportunities'. 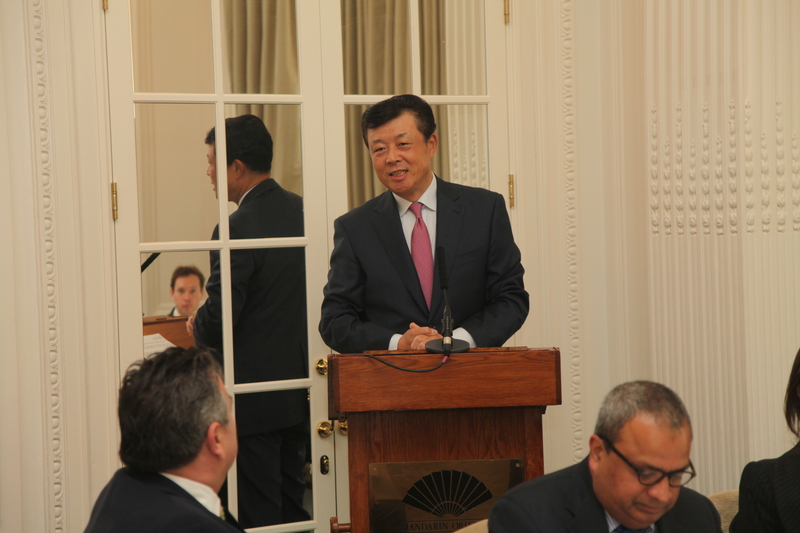 Business leaders like you are in the prime position to help keep China-UK relations on track. Your leadership can help enable its sound development. You have the means to expand China-UK cooperation and make the economic 'cake' far bigger. · The UK government would issue an RMB denominated sovereign bond. · The famous London black taxi manufacturer would become a Chinese company. 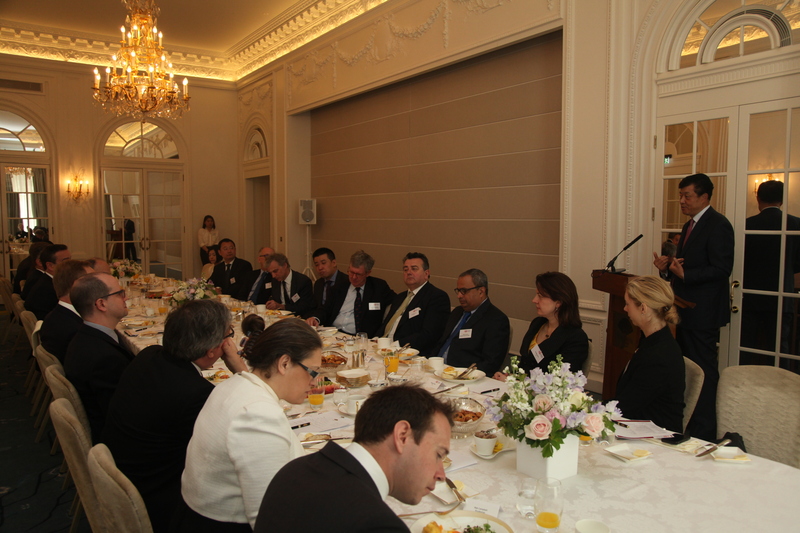 · The Scottish salmon would overtake its Norwegian competitor in sales in the Chinese market. · And that Jaguar Land Rover would sell over a quarter of its cars in China. His words were again proven right. Recently, an oil painting by the master set a new world record for the most expensive artwork sold at auction. Do we have any reason at all not to imagine? Do we have any reason at all not to expect much more from the coming five years? So, let us commit to serious imagining! Let us make the most of this 'golden time'.